The Minnesota Timberwolves’ trade of backup point guard Jason Hart didn’t exactly go as smoothly as planned. Timberwolves president David Kahn was in talks with the Hornets about acquiring Brown, a 6-foot-5 guard shooting a career-high 41 percent from 3-point range this season. The Hornets were looking to dump Brown’s $1.1 million salary and the Wolves needed perimeter shooting. Just one problem — the deal wasn’t done. The release somehow found its way into cyberspace, and the trade never materialized. So it was removed from the site and the Wolves eventually announced a deal with the Suns for Tucker, a 6-6 forward that has had trouble finding playing time in three seasons in Phoenix. “All I know is we were in conversations with teams,” Wolves coach Kurt Rambis said before Minnesota’s game at San Antonio on Tuesday night. Ted Johnson, Timberwolves senior vice president for communications and chief marketing officer, said the release on Brown appeared on a “dead” Web page. Here is one vital thing I’ve learned in my other three years of blogging at OTB Sports. Don’t write posts till ‘news’ is official. I get most of my sports reports from ESPN. Much of ESPN’s reporting starts ‘Sources say…..”. The source is always another media outlet and the ‘news’ a unconfirmed report in regard to some sports team or athlete. I’ve made it a practice in the last year, to avoid blogging these reports till the news becomes official. If it ever does. What happened with the Minnesota Timberwolves arose out of human error and had no other other motivation than to keep its fan informed. The mistakes made by the media in regards to the Tiger Woods have stemmed from the competition to be first in reporting ‘news’ about the golf star. Too many media outlets are reporting without the slightest bit of background checks and like today, a local television station in Florida is reporting something that is discredited for at least two days. The Phoenix Suns have fired coach Terry Porter, just four months into his first season with the club and the sputtering team barely in playoff contention. Assistant Alvin Gentry was appointed interim coach. Gentry promised a return to the fast-paced style that best utilizes the team’s talent, particularly the skills of playmaker Steve Nash. “We are who we are and I think we have to go back to trying to establish a breakneck pace like we’ve had in the past,” Gentry said at a news conference announcing his promotion. 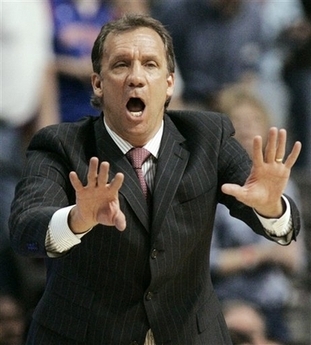 The Suns are the eighth team to fire a coach this season, meaning more than one-quarter of the league’s coaches are gone at the All-Star break. Most of the eight coaches who lost their jobs were with bad teams and you say their earned the pink slip. The firing of Porter and Maurice Cheeks in Philadelphia look shaky to me. Is four months as head coach with an organization enough time to prove yourself? The Boston Celtics transformed themselves from a lottery team to a playoff threat by trading Al Jefferson and a sack of magic beans to the Minnesota Timberwolves for superstar Kevin Garnett. Kevin Garnett gives Boston a new Big Three that brings the Celtics much closer to what their old Big Three delivered â€” an NBA title. The Celtics, who have 16 championships but have gone without one for more than two decades, obtained the former MVP and 10-time All-Star on Tuesday in a 7-for-1 deal â€” the NBA’s biggest trade for one player. Boston sent the Minnesota Timberwolves forwards Al Jefferson, Ryan Gomes and Gerald Green, guard Sebastian Telfair and center Theo Ratliff, two first-round draft picks and cash considerations. Besides Ratliff, 34, the other four are 24 or younger. With Paul Pierce and Ray Allen already on the roster, the Celtics have been transformed from a promising collection of youngsters who had the NBA’s second-worst record last season into an instant contender in the mediocre Eastern Conference. The Celtics won their last championship, the third with the original Big Three of Larry Bird, Kevin McHale and Robert Parish, in 1986. Two members of that club orchestrated Tuesday’s blockbuster trade â€” Celtics executive director of basketball operations Danny Ainge and Timberwolves vice president of basketball operations Kevin McHale. But Ainge cautioned that it’s much too early to equate the two trios. “These guys will never be the Big Three until they win” a championship, he said. 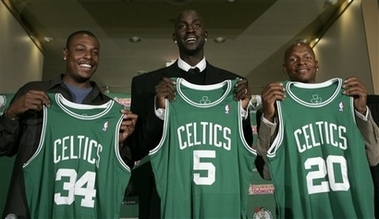 Garnett signed a multi-year extension â€” Ainge wouldn’t say how long. He had one year plus an option year remaining on his contract. The Timberwolves get the Celtics’ first-round pick in 2009, unless it is among the top three, and a return of Minnesota’s conditional first-round draft pick obtained in January 2006 when they sent Ricky Davis to the Timberwolves for Wally Szczerbiak. The Celtics traded their future for a chance to win now. Given that all of their new Big Three are over 30, they’d better do it quick.